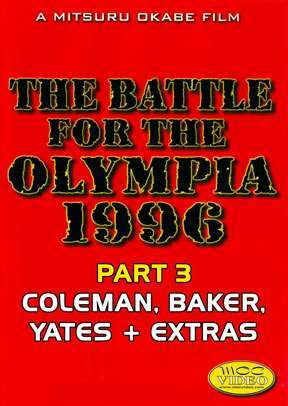 Battle for the Olympia 1996 – Part 3: Featuring Ronnie Coleman, Aaron Baker and Dorian Yates (plus extras): This is where the “Battle” legend all began! The camera follows some of the top pros as they train and prepare for the 1996 Mr Olympia showdown! Let the battle begin! In this DVD see training, posing, talking and pumping as Ronnie Coleman, Aaron Baker and Dorian Yates do their stuff. Includes backstage activities at the 1996 Mr. Olympia in Chicago.